My long-term work assignment on the other side of the country led me to locate and purchase a bicycle. 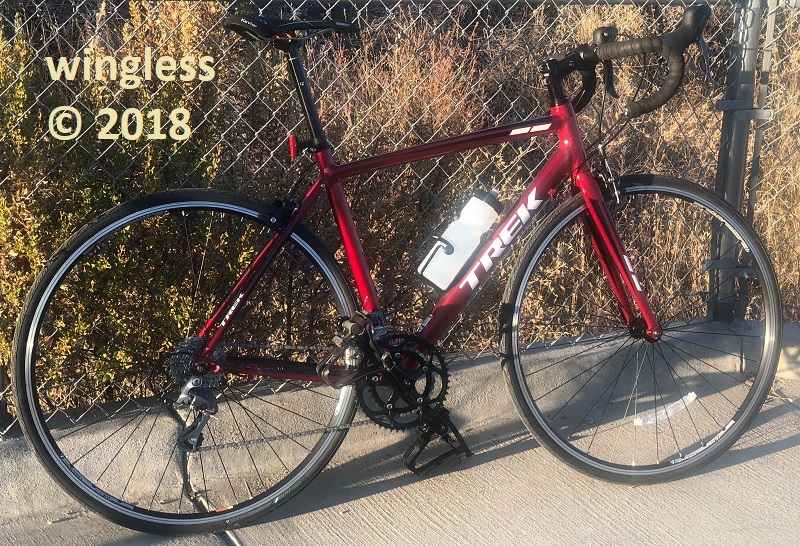 I found a like-new Trek bike that I'll be bringing home when I'm done. 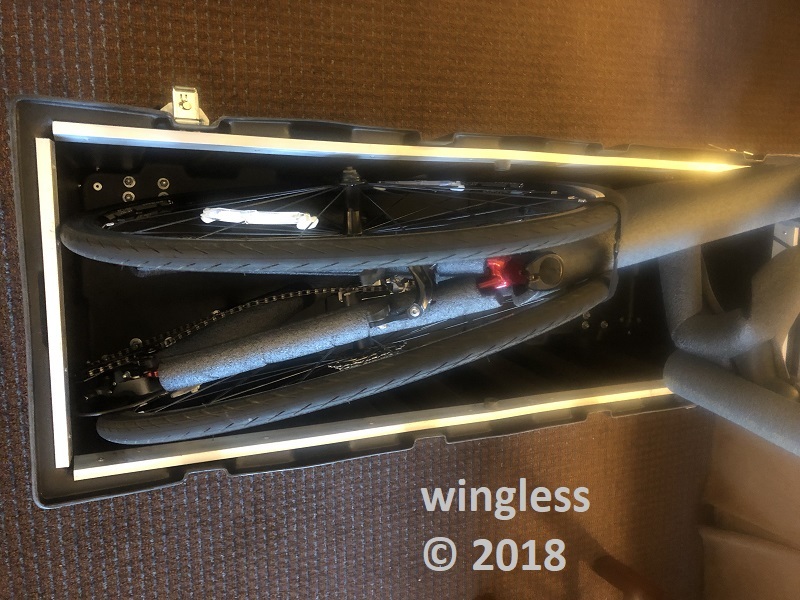 The options for airline bicycle shipping cases were explored. There are many options. In the end I selected the Tri All 3 Sports Velo Safe Pro Series "Custom Road" Bicycle Case. This is a two-piece crate, bottom half w/ casters and top half w/ pull strap. The enclosure is made from high molecular weight polyethylene. The perimeter on the top edge of the bottom half has an attached aluminum angle metal, for strength and stiffness. There are 1/4" thick plastic reinforcement base plates between the casters and the bottom case. The side plates on the rear casters are rigid, the front casters are full swivel. There are four 1/2 turn draw-down turn-to-open draw latches that secure the top and bottom halves together. Two latches have padlock holes. These are on opposite diagonal corners. I use a TSA lock at those locations to ensure my stuff doesn't disappear. The case has attached Velcro flaps that cover the latches for shipment damage protection. 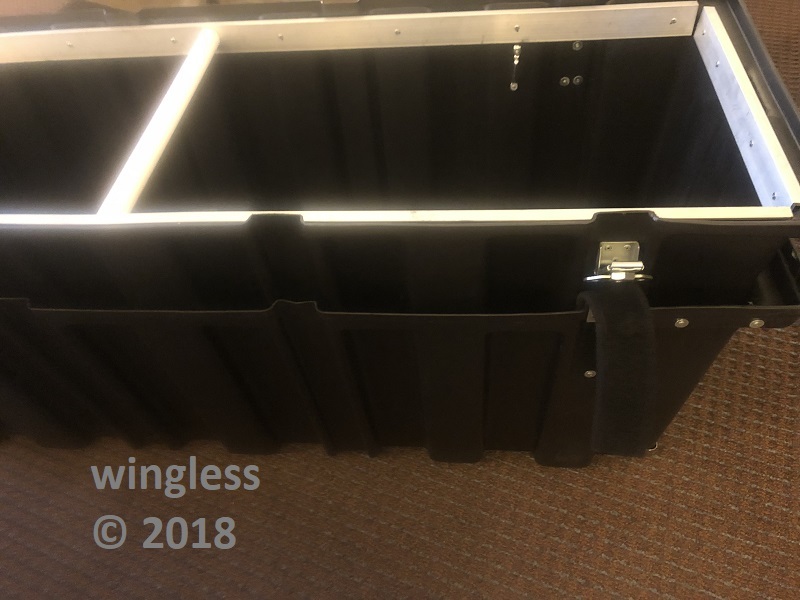 There are two long belts that wrap around the case, fitting into recesses for additional strength and security. The case front has a pull strap for ease of movement. 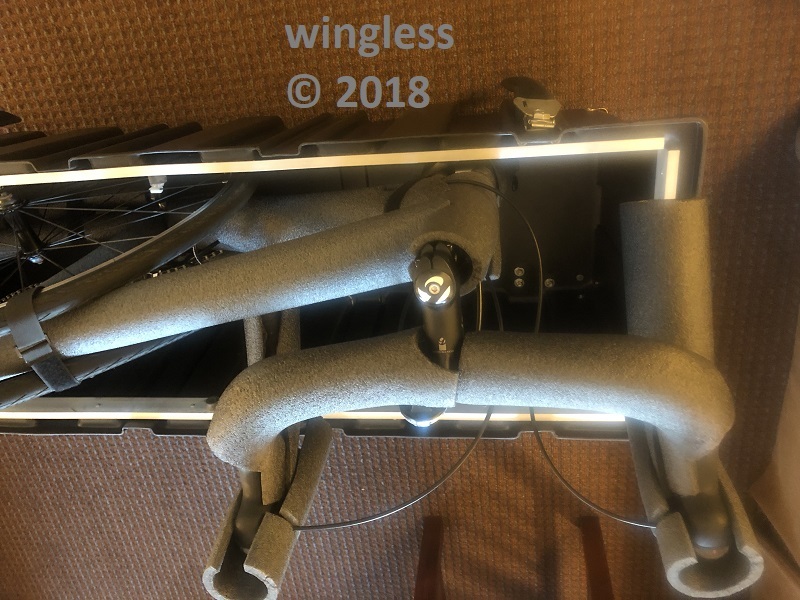 The case also includes a 3/4" PVC "Gorilla Bar" pipe that goes side-to-side, through the bike frame and wheels, that provides strength to resist compression forces when weight is applied to the side. The manufacturer's web site shows the case resisting abuse from the airline gorillas. For non-use storage the bottom half stacks within the top half. The case exterior dimensions are: 51" x 32" x 18". The interior dimensions are: 47" x 26" x 15". The weight is specified to be 35 lbs. The case usage is "easy ". Remove the wheels and pedals , turn the handlebar and secure to the interior. For my usage, I also remove the SRAM chain using the master link, unscrew the rear derailleur and remove rather than lower the tall seat post. The front fork is secured to the base using their internal fork mount. 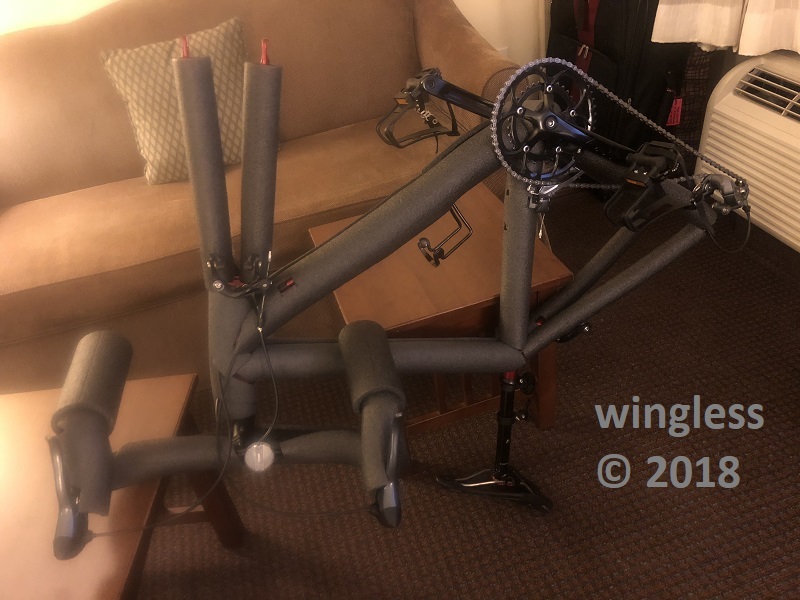 This is a really cool custom aluminum extrusion w/ a heavy duty quick release lever, like on a bicycle, but not with a skinny skewer, to fit in an axle, but instead with a fat axle-diameter cross bar that appears very strong. In my application I needed to relocate that internal fork mount bracket by 1-1/4" to attain the desired fit for my bicycle. That was "easy", unbolt, drill new 1/4" holes through plastic and tighten at the new location. The manufacturer suggests using foam pipe insulation to protect the bicycle finish. 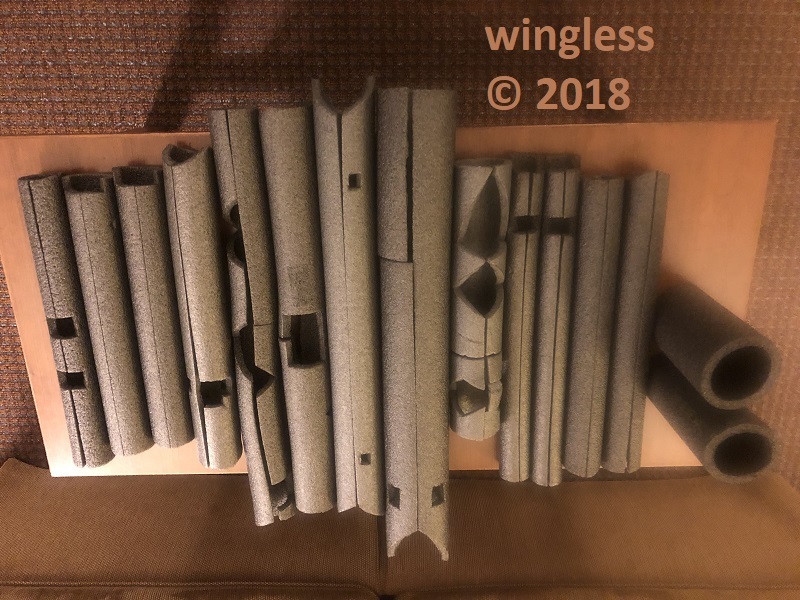 I take things to the extreme and bought a 6' section of foam pipe insulation in these sizes: 1/2", 3/4", 1", 1-1/4", 1-1/2" and 2" to fit the various locations one e bike. These were then snipped to fit for full-coverage of this custom foam wrap. 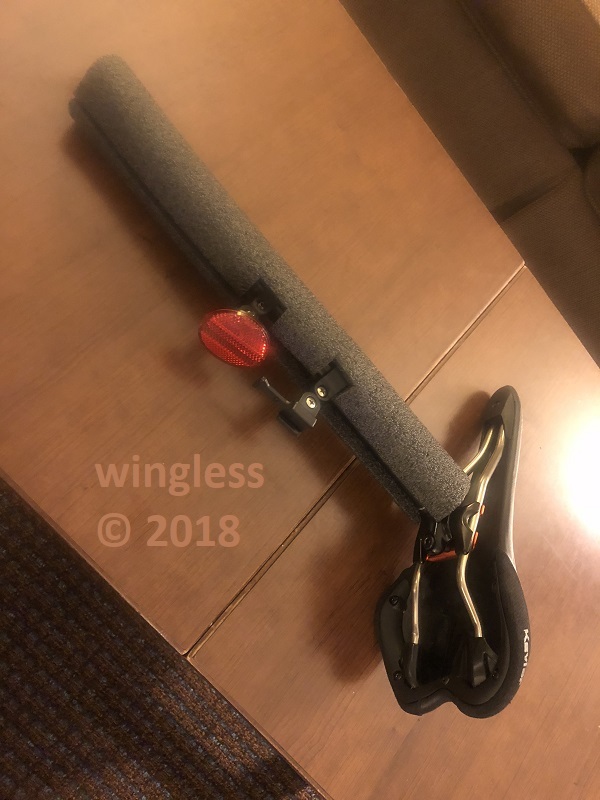 All I do is remove the required parts, snap on or slide on my foam, quick latch the fork, place the wheels, Velcro strap the frame, the rear chain stays and the wheels, so the bike isn't going anywhere. In my case I also wrap and secure the dangling rear derailleur. Here is the Custom Road Packing Instructions . Once the bike is secured there is plenty of room remaining, plus plenty of weight, before reaching the airline limit. 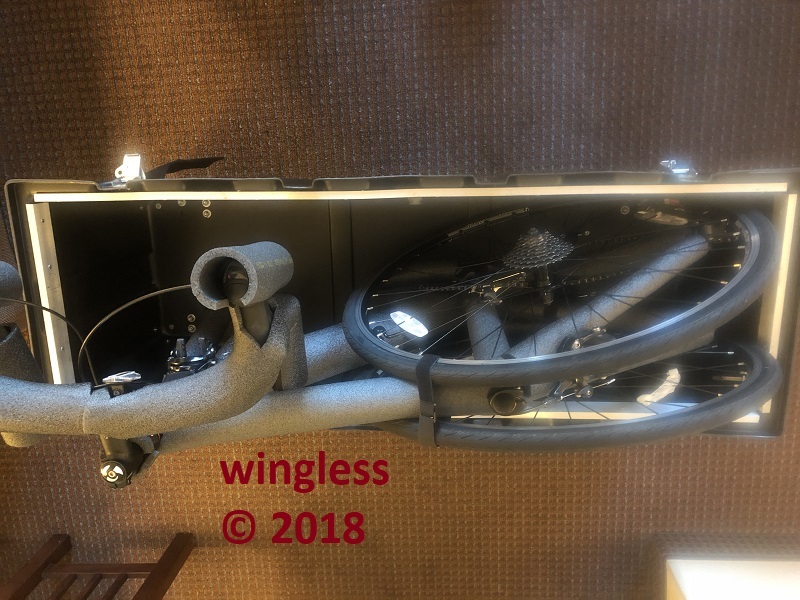 The case is specified at 35 lbs, plus the bicycle weight, and there is enough remaining before reaching the limit, in one example of 70 lbs, check the special cargo section for your airline. This leaves room for the helmet, clothes and tools. This is a well, conceived, designed and implemented product. The manufacturer provides excellent support. I have zero reservation recommending this product. This was purchased by me with cash from my pocket. I have zero affiliation with the manufacturer or the vendor. 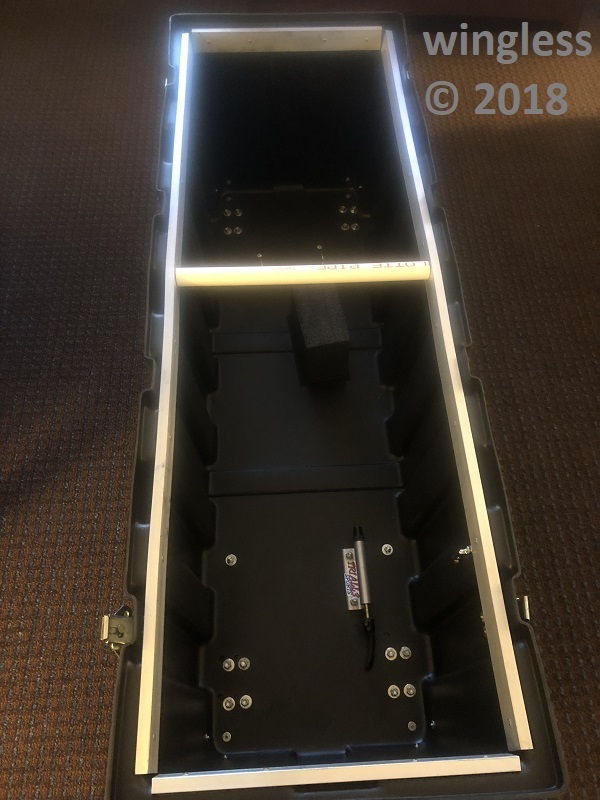 Here are the additional images showing the packed bicycle. Bikes: LOOK 595 Ultra/Campy Record 10Sp, restored Guerciotti/Campy C-Record 6 Sp, TIME RXR/Campy SR 11Sp, and Colnago C-60 with Campagnolo SR 11sp. 1. How cumbersome or difficult is it to drag that case loaded up stairs? 2. How much were you charged for the case on each leg of the trip? 3. How difficult is it to fit it inside small or medium sized vehicles? 4. If you don't mind me asking, and you can PM me the answer if you prefer, but how much did you pay for that bad boy? Arguing with ignorant people is an exercise in futility. They will bring you down to their level and once there they will beat you with their overwhelming experience. 1 - The case is either rolled on flat ground when loaded, or carried empty (one person) unloaded. It appears to be too unweildy to carry loaded. When unloaded the bottom fits into the top, permitting the pair to be carried w/o issues, including up stairs. 2 - Every airline has their own regulations and charges. Check with the specific airline for charges and compliance. My flights were $150 each way. Other airlines charge less. This case is fully compliant w/ every airline I checked. 3 - The empty stacked shell fits inside a 4-door Kia Optima. The rear seat risers are folded down onto the rear seat cushions, making a full-width flat surface. The front seats are slid forward, then the case is slid in through the rear door. The only difficulty is moving the shoulder belt out of the way. The front seats are then positioned as-required. 4 - The manufacturer lists the cost on the previously-linked web page. 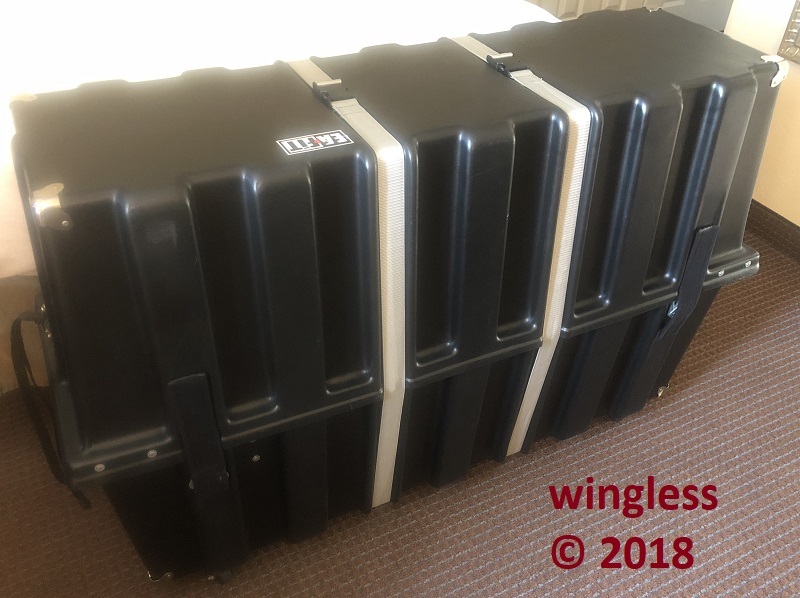 The used costs for airline cases (of all varieties and of all manufacturers) on Craig's List and on Offer Up were all in the same price range, in my area, when I last checked. 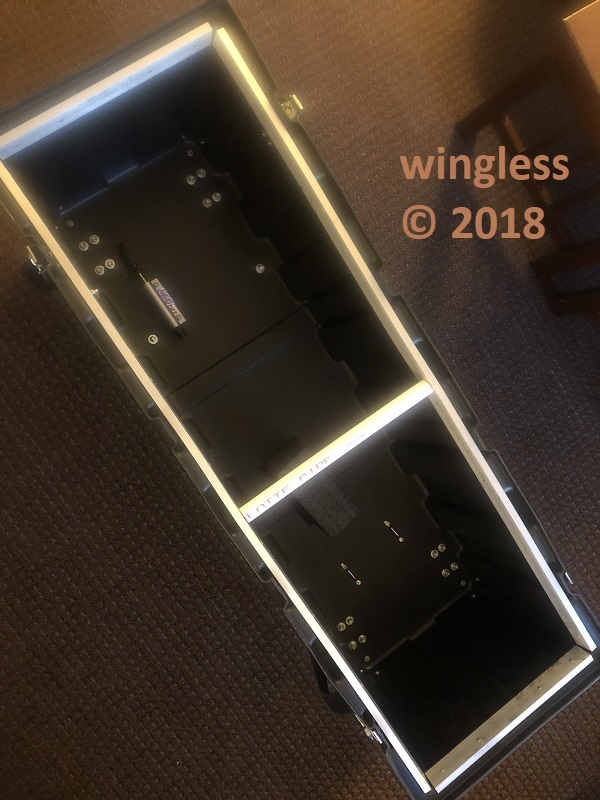 The exterior dimensions of the stacked case halves are: 51" x 20-1/2" x 18". 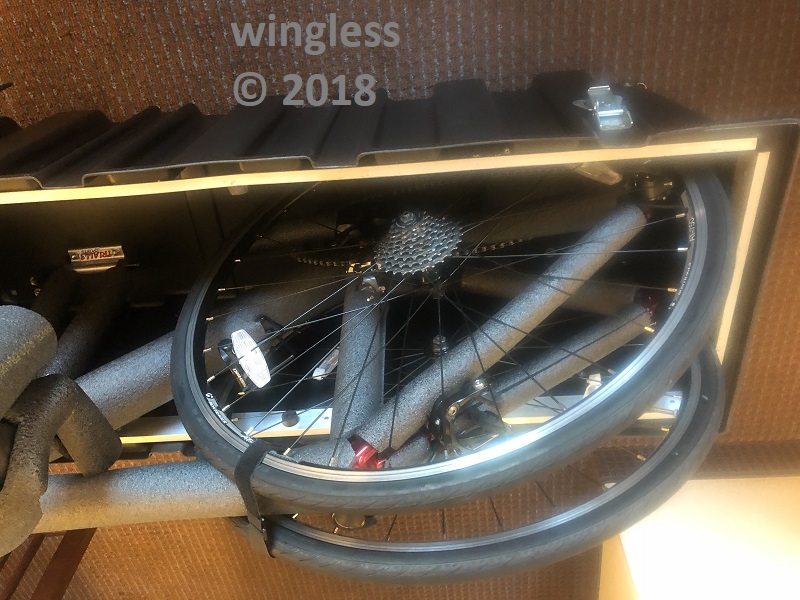 The last time I went to use my case I was unable to determine why my bicycle (which fit perfectly during the prior usage) was unable to fit when securing during this placement. Of course I was rushing, expecting everything to go smoothly and did a quick fix instead of understanding the real issue. The problem was at I was unable to rotate the handlebar far enough clockwise for the fork dropouts to properly engage the case axle extrusion mount. 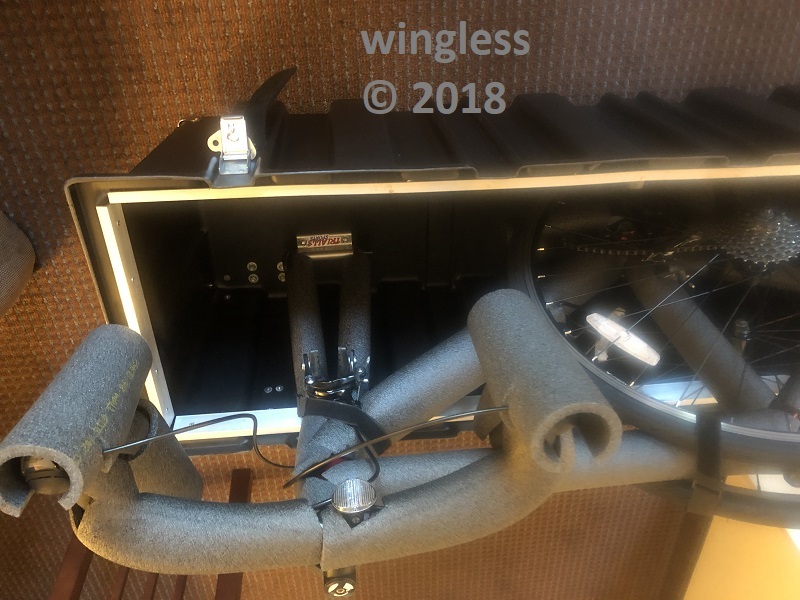 What I didn't recall at the time was that I had adjusted the rotation on my handlebars for a better fit during riding between shipment case uses and the latest position decreased the available handlebar rotation, making it not possible to properly fit into the extrusion mount. Now I know the problem (that I created) so I can resolve prior to the next usage. Last edited by wingless; 11-10-18 at 09:07 AM. 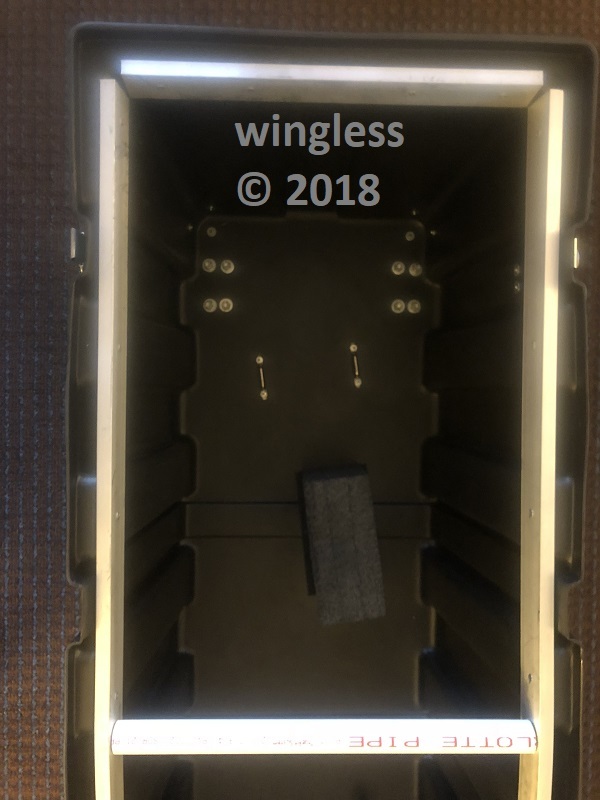 During my latest usage of this case, it was presented to the airline at the counter, then wheeled off by their staff to the baggage handling area. The case was next observed through the window, being loaded onto the airplane. The case was closed, but the 1½" wide wrap-around snap straps were not on the exterior. It was again observed being unloaded at the layover, also still closed w/o the exterior straps. The case was the first article on the baggage carousel still intact. Every time the case was observed during airline handling it was always laying on the side, never being moved by the wheels. 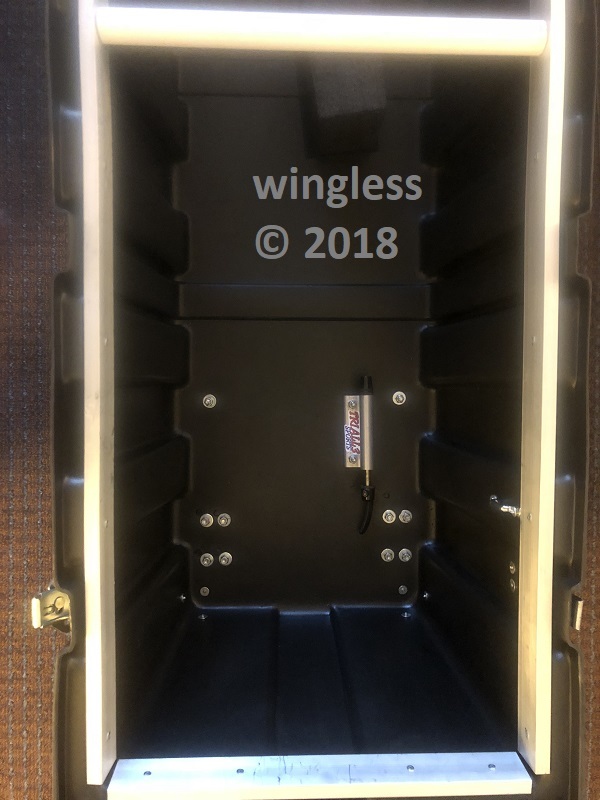 When I opened the case for inspection the "missing" exterior straps were flopping loose inside, next to a TSA baggage inspection tag. My conclusion is that the TSA opened my bag, removing the straps and instead of replacing them for the strength and security provided by the straps, tossed them into the interior. The straps are very useful to bear the brunt of the handling abuse, instead of everything being handled by the ½ turn draw down latches. Prior to the next usage I'm going to figure a way so the straps are partially attached to the case, to ensure proper usage going forward. This is still a great case. The bicycle packed / unpacked quickly and arrived at the destination undamaged. The extra interior volume and weight allowance is very handy for packing a floor pump, helmet, clothes, tools and accessories. The airline I just used has a 100 lbs weight limit. I was packed to 70 lbs with the bike, case and listed stuff. It was raining during the loading and unloading onto the airplane, but the contents of my case were dry when received. 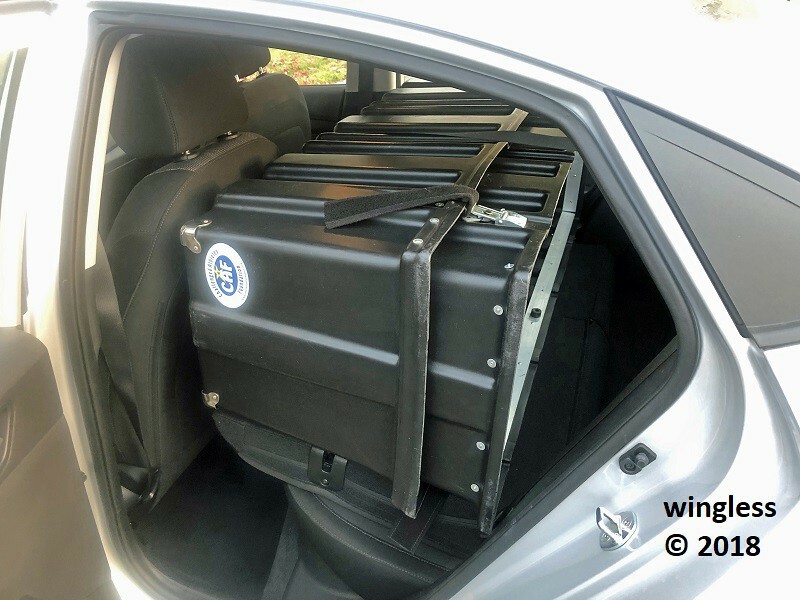 This shows the case in a smaller car, a subcompact Hyundai Accent. It just fits in this subcompact car. 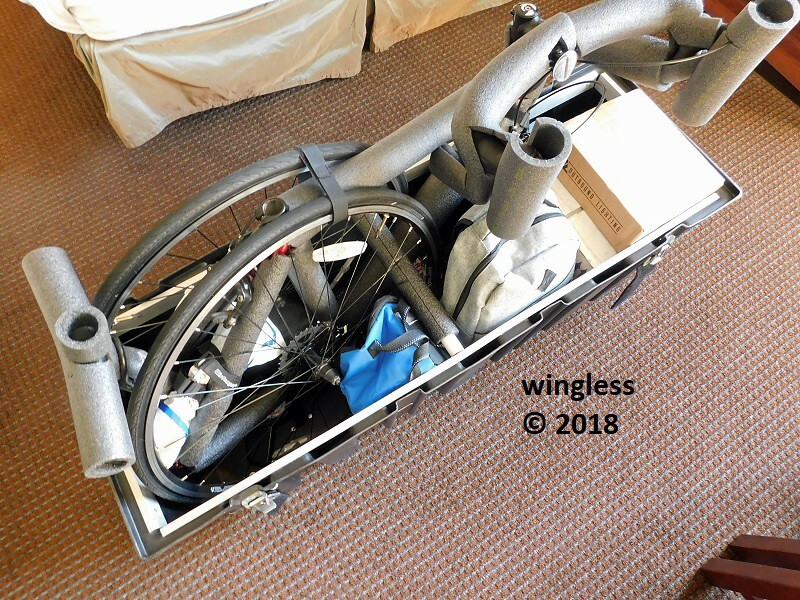 When I arrive at the airport I remove the case from the back seat, the bicycle from the trunk, load the bicycle and the other contents, then go. 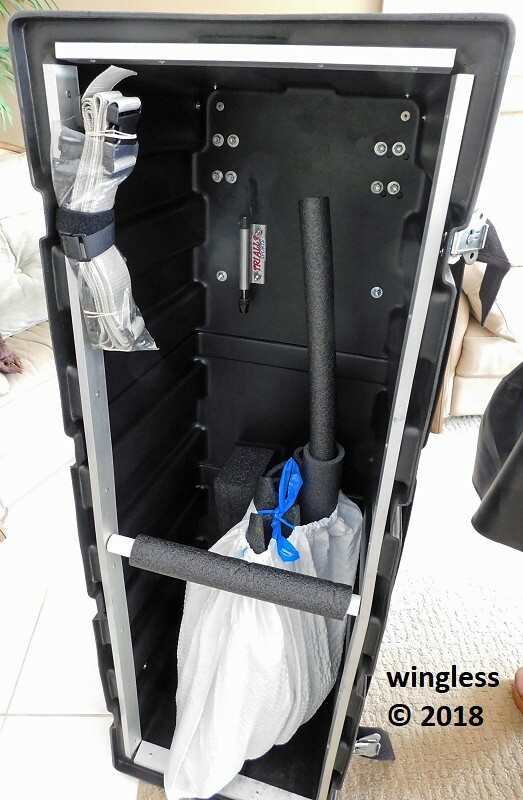 This shows the case stored vertically, with the foam bicycle wraps in a tall plastic trash bag and the straps attached to the perimeter frame, ready for the next usage. One of the draw-down latches had been partially damaged during a prior case usage. The metal was improperly bent making operation slightly difficult. Now the latch operates properly again. It was reattached to the case using three 1/8" diameter by ½" long rivets.